SMI manufactures a range of pressure sensitive adhesive tapes for a wide variety of assembly, bonding, mounting, sealing and protection applications. SMI’s tape applications include splicing, bonding, surface protection, temporary attachment, bundling, sealing and shielding. Our diversified technologies have allowed us to stay on the cutting edge of adhesive tape manufacturing and innovation, and our ISO/IATF 16949 certification means we can meet even the most demanding specifications. Our manufactured products can be found in dozens of applications and hundreds of products. Through long-term partnerships with leading raw material manufactures, we have access to the most advanced materials at very competitive prices. 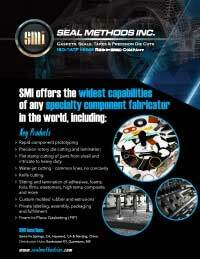 SMI’s expert staff can customize unique tape constructions, adhesives and liner combinations that best meet your performance, price and process requirements. We thrive on innovation and delivering products that exceed customer expectations. SMI tape products include adhesive transfer tapes (unsupported adhesives), single-and-double-coated tapes, and foam and mounting tapes. We use a range of materials to create the ideal product for your application, whether high quality silicone, acrylic, rubber or butyl pressure sensitive adhesives – all of which can be applied to a variety of plastic, paper, foil, fiberglass, non-woven and foam substrates. Specialty Tape Manufacturing by Seal Methods Inc.
With decades of experience, 350,000 square feet of capacity, and quality certifications you can rely on, Seal Methods is an industry leader in custom seals, gaskets, and tapes. Our sales engineers guide you through the selection of an almost limitless number of choices to find the one most appropriate – both performance-wise and price-wise – for your application. SMI in-house capabilities mean our experts can specify, design, and manufacture everything on site, so our clients get the right material for their functionality, as well as cost savings and exceptional quality control. Contact us online or call 800-423-4777 to learn more.